The Circus Maximus was the arena for mass entertainment instituted by the Etruscan kings and then enhanced by subsequent emperors for tens of thousands of spectators. Trajan, Julius Caesar and Augustus, among others, added to, and enhanced, this structure. Its chariot races were a particular feature of its activities in later times. In the theatre of his mind, the great Italian auteur, Federico Fellini, casts forth his films as entertainment, serious entertainment which is worthy of the greatest art that the twentieth century produced. However, it is no good coming to Fellini looking for Thomas Mann or Persona. Fellini is just not that kind of artist. He puts his trust in his feelings, and he believes that feeling is the way to discover the reality of the world. He doesn’t believe in intellectualising about life or art, or in theorising about art either. But to say Fellini is not intelligent in his films would be wrong. Fellini is supremely intelligent as film director. He shapes his films as carefully as any novelist or poet does in the silence of their rooms. Circus Maximus translates from the Latin as largest circle, and it is this largest circle which Fellini draws around the world, enclosing in its phantasmagoric visions the poetry and pain of a loving heart. He invites his audience to participate in his films as would the audience at the Circus Maximus for some games spectacular. You may sit around the edge of the circle and enjoy the surreal passing parade, smell the sawdust, see the most startling use of colour, and of black and white. If he allowed himself to be styled emperor in his domain, Cinecittà, he always did so with a light touch, and he could be scathing about his own persona—he virtually accuses himself of fraudulence in Otto e mezzo. Of course Fellini was no fraudster but a subtle artist of the most unusual kind. The caricaturist from Rimini went on to become a true maestro. 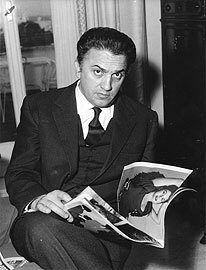 Fellini’s films are musical, and the word maestro is not inappropriate to use in association with his work. His orchestra is his production team—and what a singular group of artists he gathered together for his purposes. It is doubtful that films like Fellini’s could ever be made without this kind of team to work with. Underwriting the whole endeavour is the music of Nino Rota who provides such an insouciant soundtrack to Fellini’s visual panoramas, by turns tender, melancholic, wistful, or vital and exuberant, music for eating, laughter, dancing and loving. But Fellini knows when to keep the soundtrack silent too. Usually, somewhere in a Fellini film, there is that sudden silence followed by the sound of wind, premonition of an ending Fellini doesn’t try to understand. He simply accepts death as part of the spectacle we must all participate in. It is to be regretted that the main way people now come to Fellini is through re-release on DVD, or on television. If ever a director needed the big screen it is Fellini who designed his films as a medium in which there is a participatory audience. I remember two experiences in my early years of picture going. The first time I saw Otto e mezzo it was a revelation to me, and I also found it profoundly moving. And I almost hurt myself laughing, along with the rest of the audience, when I saw the family argument around the table in Amarcord. I doubt I would have had these reactions if my first viewing of these films had been via the television set. Fellini embraces you through the screen. If you can’t participate in the manner of an Italian feast, you won’t get the best out of his films. These are not works of art for people who want to sit at a distance in judgement. They are meant for enjoyment, involvement. His camera is lascivious, and it gets very close to its subject matter, which some people find disturbing. And people who think Pulp Fiction instituted some new kind of film narrative need to have another look at Fellini’s work, especially from Otto e mezzo onwards, just as cliched ideas about Fellini’s sexism ignore a lifelong preoccupation with the facade of Italian machismo. For some, Fellini’s films can be a stretch, they ‘don’t wear well’, his sensibility, with its strangely compatible dual carriageway of sensuality and moral prodding, being at odds with present conformities. Satyricon especially is difficult to get hold of. On one hand it is a spectacle which Fellini fills with characteristic striking visuals. On the other, it comes across as cold, as if one was visiting a moonscape. Fellini called it science fiction of the past. Perhaps it was his comment on what he saw going on about him in supposedly liberated times. True, you don’t want to sit down to a tranche of his films in one go. His work is intense, baroque. There is maximum sensory overload. He is like Emily Dickinson and Bruckner in that way; you can’t take on too much of their intensity at one time. It would be a mistake to try to because then the appetite sickens. These are artists who are for a lifetime. You can always come back to them and their depth and seriousness will always be there for you when you have need of it. The fact that Fellini insists on joy being part of his sensibility makes him the major artist he is—he refuses to degrade himself in the manner of so many European intellectuals and artists who mortify themselves with doubt, self-hate and cynicism. It is not as if Fellini avoids tragedy. Who could forget Zampano’s despair on the beach at the end of La Strada or Marcello’s horror at Steiner’s suicide and the murder of his children in La Dolce Vita. Fellini is the realist who accepts suffering but who nevertheless insists on the pleasure principle too. One of the things Fellini takes most pleasure in is the human face. For him, it is endlessly fascinating. Fellini does not, contrary to a lot of Fellini criticism, put freaks in his films, but the variousness and beauty of the human face and form. In that sense he is a portrait painter, filling the screen with characters that give witness to the strangeness and majesty of the human: the alluring image of Anita Ekberg standing in the silent Trevi Fountain, the fantastical ecclesiastical fashion parade in Roma, the out-of-touch aesthetes on board the Gloria N. in E la nave va.
Was ever a director luckier than to have Giulietta Masina as a life companion? How one marvels at this actor’s performances in Fellini’s films. I am especially fond of her work in Giulietta degli spiriti. Here was companionship that led to beauty and greatness. But all Fellini’s actors seem to belong to a troupe. The circus master may crack the whip, but what performances he gets from his casts. How vital his characters seem with their dreams and delusions, their grandeur and pettiness, their gross appetites, their inwardness and hopefulness. Opera, theatre, cabaret, vaudeville, circus. Luminous and celebratory, fantastical but all too real. Cinema. Art. Fellini is all of these things. For me, his films are inimitable, poetic, unforgettable. The following poem was written in late October 1993 when the press reported Fellini’s stroke. Must we say farewell just now? Trumpets at the darkened gates? We know your passion will be strong. And mischief that shows kindliness. You maker of the marvellous! To silence in unending night. Whose joy is deep, whose laughter was so wise.